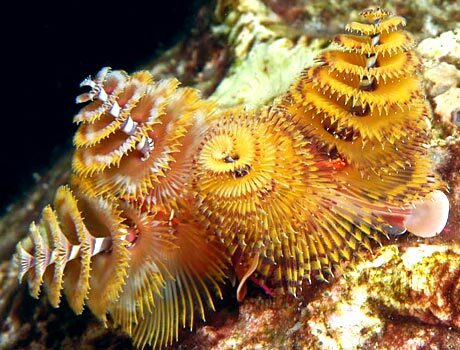 This image of Christmas tree worms (Spirobranchus giganteus) was captured by NOAA photographers. The feathery "branches" serve as the animal's respiratory organs. They also help the worms to filter bits of passing food from the sea water. The remainder of the worm lives in a hole commonly bored into coral or rocks. It secretes a calcareous coating inside the tube for additional protection. This image was taken in the Flower Garden Banks National Marine Sanctuary in the Gulf of Mexico on July 31, 2006.